Mike’s latest release, a collection of forty stories that all clock in at 100 words. I’ll stop rambling now and let him tell you… Is it Just Fiction? Are the characters extension of you, the author? If yes, in what way? Sometimes they are, but rarely is it ever intentional. I always write the characters the way I see them in my mind, and sometimes I can see a little of me sprinkled throughout some of them. Especially in the slice-of-life short stories I write. It’s never a goal to do so, it just happens. “Where in the world did you come from, Character XYZ?” How do your characters take shape? Sometimes I think of a possible conflict first, say a break-up or some kind of a problem, and how that character reacts to it is how I see him/her take shape in my mind. Just like the readers, I’m learning about the characters like they are. I do my best to write them like real people, even if they’re exaggerated. Even in the horror drabbles I write (100-word stories), I still see them as real people. Where do your characters live? Physically, where are they stored? I think they live on Earth. Unless they’re lying to me. They might be lying to me… They do that sometimes! What happens to them when you aren’t taking note of their lives? When (if) they do something diametrically opposed to your beliefs, how do you handle that? I write them as honestly as I see them in my mind. I do my best not to censor them. Sometimes I think readers get the idea that just because our characters act a certain way, then it’s something we condone. My characters say and do horrible things at times, but that never means I condone it or I think the way they do. It’s best to write them exactly the way you see them, no matter what. When your characters go off script, do you let them take the lead or force them into your outline of how the story unfolds? Do you trust them to know how to tell their story? I usually have a general idea of how I want things to go, but I’m always open to something happening that I didn’t plan or intend. Sometimes that’s when the best writing happens. When your characters surprise you and take you down a different road you didn’t plan on. I trust them. I go with it, seeing what the possibilities are. I know I can always go back if I don’t like the route they’re taking. But especially in first drafts, I think it’s important to keep an open mind and let things happen organically. Would you describe your writing as more plot-driven or character-driven? Definitely character driven. I wished I could come up with more complex plots, but that’s not the type of writer I am. I’m always far more interested with the characters, and almost anything they do can become a possible plot idea for a story. Michael Crane is an indie author and short story writer. Switching between slice-of-life fiction and horror stories, he is the author of In Decline (stories), Giggles (a novella), and a number of drabble collections (Lessons and Other Morbid Drabbles, Lessons II: Another Morbid Drabble Collection, Lessons III: Demonic Dolls and Other Morbid Drabbles, Lessons IV: The Dead Carnival and Other Morbid Drabbles, and the newly released Lessons V: The Terrible Town and Other Morbid Drabbles). He currently lives in Illinois with his wife. You can reach Mike via Facebook or follow him on his Amazon author page. 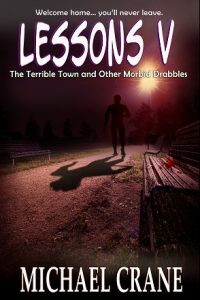 His latest release, Lessons V, is available at Amazon, BN.com, and Smashwords.